The UK is set to be battered by heavy rain and strong winds again after storms Ali and Bronagh wreaked havoc this week. The Met Office has put yellow warnings for wind and rain in force from 6am on Sunday until midnight. Both warnings are in place for London, south-east England, south-west England, the east and west midlands, east of England, Wales and Yorkshire and Humber. The yellow warning for rain is also in place for north-west England. 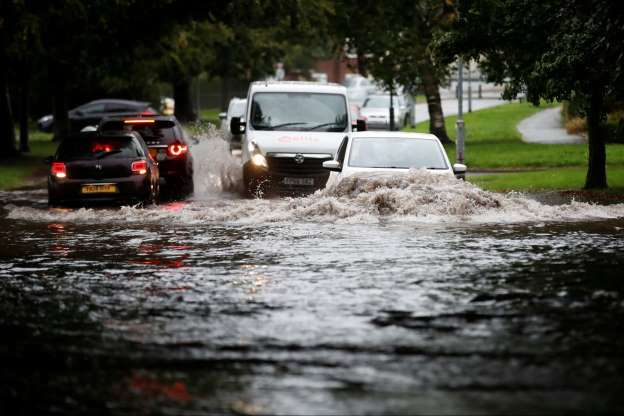 Forecasters said that there remained some “uncertainty in the precise track and intensity of the system” but there could be up to two inches of rain in places. Southern Britain could fell the worst of the spell of strong winds and a swathe of persistent heavy rain, the Met Office said. “The exact timing and intensity of the associated weather system still remains uncertain, but there is potential for strong winds to develop across the west early on Sunday, strengthening further as the system tracks eastwards,” the Met Office said in a statement. Met Office spokesman Graham Madge said “reasonably good weather conditions” were anticipated during the rest of Friday and on Saturday as Storm Bronagh was now leaving our shores. “It exited the North East last night and in the early hours of the morning into the North Sea, although the back end of the storm will still cause heavy winds in offshore areas in the North East,” he said. Mr Madge said forecasters anticipate nationwide sunshine and showers in the coming days, with some strong winds still anticipated. Saturday is expected to bring rain moving from the South West into the South East and the Midlands as the day draws on. Despite the warnings in place for Sunday as another “low pressure system” moves in, Mr Madge said it will be “perhaps not as bad as first feared”. At its worst, Bronagh brought heavy rain and showers as it swept across the country, with 78mph gusts recorded overnight in the Needles on the Isle of Wight. Earlier in the week, two people were killed as Storm Ali hit the British Isles. A woman died after her caravan was blown off a cliff during high winds and has been named locally as Elvira Ferraii. A man also died after being hit by a falling tree as he worked in a country park in County Armagh. Gusts of up to 100mph were recorded in parts of the British Isles.